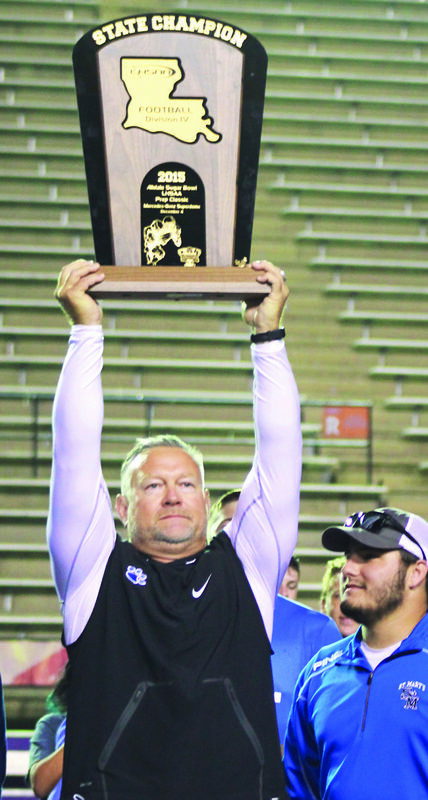 2015 Head coach Lee Doty strikes a victory stance by holding the trophy aloft during the presentation. The Saint Mary’s Tigers tamed the University Academy Lions at home Thursday night with a score of 70-6. The Tigers were coming off a hard fought victory on the road against Loyola and were looking to keep their foot on the gas pedal as they resumed district play against the newcomer Lions. University Academy, based at LSUA, has yet to log a victory this season. Thirteen Tiger players and their families were recognized pre-game for senior night. The game was the last regular season home game. The Lions won the coin toss and elected to receive the opening kick from the Tigers. They quickly impressed upon the Tigers that despite their record, they had come to play. Jaylen Walker faked the handoff and found running room off left tackle to rush 20 yards. The drive would halt four plays later; when Jeremy Friedel was not fooled on the option and sacks Walker for a loss. Lions regain momentum after a roughing the kicker call gives them the ball at the Tiger 34. The defense had seen enough and Coach Wren took the leash off his tigers. Zach White gets his turn sacking Walker. An errant toss from Walker to Tucker Stroud is Wes Manuel’s for the taking but he fails to cover up the ball. That put the ball at mid-field and forced another punt. That first drive was the highlight of offensive action for the Lions. It would be all Tigers after that point has they scored almost at will. Their first possession and score only took two plays. Bienvenu gains about 17 yards to the 43 of the Lion’s on a pass from Howell. Nelson runs virtually untouched from there to pay dirt and puts the first score up. Point after touchdown (PAT) is good (Bankston). 7:20 to go in the first quarter SMH 7 – 0. Lions’ take the kick and go three and out punting to the Tigers. It would only take 7 plays for the Tigers to score on a keeper by Howell to the right side from 11 yards out. PAT off the foot of Bankston good SMH 14-0. Lions repeat the three and out on their post kick possession. They punt to the shifty Shelton who has to retreat to haul in the kick at his own 44. He was off to the races from there, running it to the end zone to add 6. PAT good, and the score is SMH 21-0 with only seconds left in the first quarter. The Lions repeat the three and out as the Tiger defense remains aggressive sacking Walker again in this series to bring up 4th and 14. The Tigers and Shelton enjoyed the success of the first quarter and opened the 2nd in much the same way. Lions punted to Shelton waiting at his 32, Wes Manuel had a brutal de-cleating hit on Stroud during the return and another equally effective block further down field on the return. The hits sprung Shelton for 68 yards and a score with only seconds off the clock. PAT good again Tigers 28-0. The defense continues their denial of progress by the Lion offense and again forces the punt. Saint Mary’s special teams come up big again. Zach White blocks the punt and Jeremy Friedel scoops it up at the ten and runs in to score. The PAT is good and the Tiger lead swells to 35-0. Again, three and out for the Lions on their possession. Tigers take over at the Lion 49 with good field position and a determination to score in a more conventional manner. This time it’s through the air on a strike from Howell to Bienvenu who blows by two defenders en-route to a touchdown. The point after attempt is an initial bust on a high snap from center but Howell maintains his composure and rolls out to find Bankston in the end zone for a point conversion. SMH 43 – 0. The Lions elect to try and convert a fourth and two at their own 39. They are denied on the attempt as the Tiger defense is just too much for them to gain any advantage on. The turn over on downs sets up the Tigers with a short field and the opportunity to score again. Jason Elie gets the call this time as the powerful offensive line opens holes left twice and right once for him to get the ball across to score. PAT no good Tigers 49 – 0. The ensuing kick is mishandled by the deep return man and the Tiger coverage downs him inside his own 5 yard line. Tiger defense smells blood that close to the end zone and Brock Zeagler blitzes the gap to cause a fumble that is recovered by Harrell at the Lion 1. Austin Vienne runs it in from there and the point after is good. SMH 56-0. That would end scoring for the first half and the Tigers enter the half with a dominant lead. During halftime the LHSAA presented the 2015 Division IV football State Championship to Saint Mary’s. Players from that year along with coaching staff, cheerleaders, managers, dance team and administration were in attendance and celebrated the moment. The second half of play would see a running clock for the third time this year. University Academy tried the onside kick to start things off but it was covered up by Friedel at the 50. It would take the Tigers only 7 plays to find the end zone again. Austin Vienne assumed the helm of the offense for the second half. The young Tigers flawlessly executed the drive that culminated with Vienne running in from 17 yards out. PAT good again SMH 63-0. The Lions took in the kick and try to get a first down on 4th and 6 at their own 36 yard line. That attempt was denied by the backup Tiger defense and the Lions turn over on downs. The third quarter would expire during the ensuing drive but the Tigers were not done scoring. Luke Gallien runs in from the 3 and the PAT is good again to put the score at 70-0. Jordan White got the kickoff duties from his older brother Zach after the score. Walker #9 receives the kick at his own 9 and returns it to the 22 of Saint Mary’s. The Tigers get penalized for a horse collar resulting in University Academy having the ball at the 10. The Lions are finally able to put points on the board after a 9 yard run by Walker. The two point PAT fails to make the score 70-6. An onside kick is attempted again with the same results of being covered up by Friedel. The Tigers allow the clock to expire and continue their winning ways. In the victory coach Aldredge stated, “I’m extremely proud of this senior class”. They will travel down I-49 to Northwood Lena next Friday night.